The “Other Properties” button’s dialog allows you to enter any extra properties you want to be able to edit when the interactive rename dialog pops up. Those properties will be shown below the name property entry area in the rename dialog. For example, you might use this to set the Caption of a Button while you are renaming or, or to set the checked status of a checkbox. 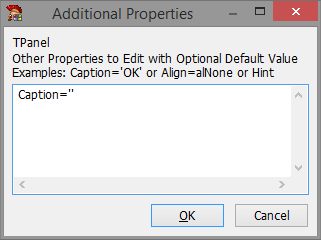 You need to enter the other properties one per line in the resulting dialog. If you want any of the properties to have a default value different from the component’s default, add an equals sign and then the default value after the property name. If you have chosen not to show the interactive rename dialog, you can still specify “Other Properties” with defaults and those defaults will apply to any new component you place on the form. Here is an example for a default value for a property that I use all the time: TPanel.Caption=” How often do you want a panel to have a caption? Thought so! I also added the option to automatically pop up the rename dialog every time you put a new component on a form. Can’t live without it any more.